Today, Casio G-SHOCK unveils the latest additions of analog digital watchesto the GA700 and GA800 lines with the Gold Accent Collection. 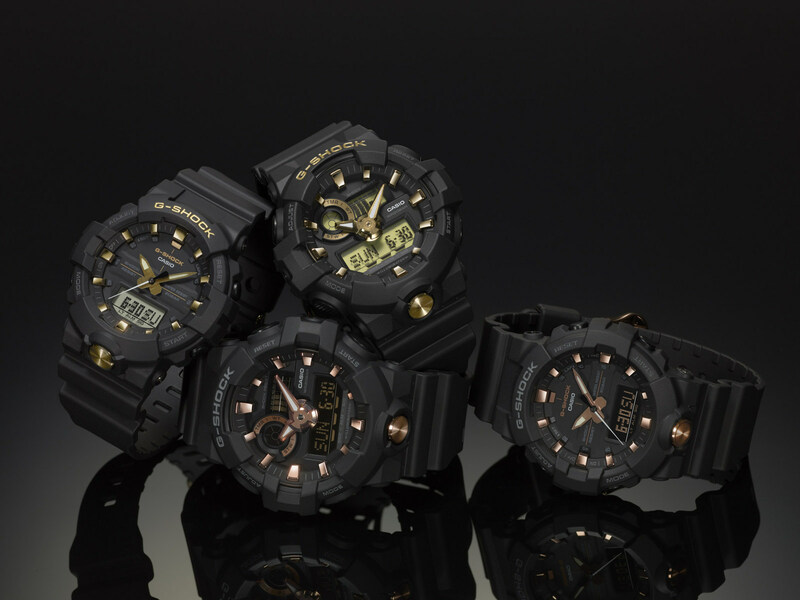 Known for its absolute toughness, the newest G-SHOCK collection features four models in colorways of black with gold accents (GA710B-1A9, GA810B-1A9) and black with rose gold accents (GA710B-1A4, GA810B-1A4). Designed with a comfortable resin band, these metallic accents add luxe detailing to the rugged timepiece; adding flair and functionality to any man's wardrobe. First introduced in the fall of 2016, the GA700 model debuted with a re-imagined case design, featuring a prominent front button for easy access to the super illuminator LED light, as well as an easy to read 3-D dial with multi-dimensional hands. Similar to the GA700, the GA800 was first introduced in the fall of 2017, and also includes a large front button for the super illuminator double LED light. In contrast to the GA700, GA800 models are smaller with a mid-size case design of 48.6mm for those looking for a more subtle timepiece accessory fit. The GA710B-1A4, GA710B-1A9, GA810B-1A4, and GA810B-1A9 will retail for $130 and will be available for purchase beginning in June 2018 at select Macy's, select ZUMIEZ, shopcasio.com, and the G-SHOCK Soho Store.